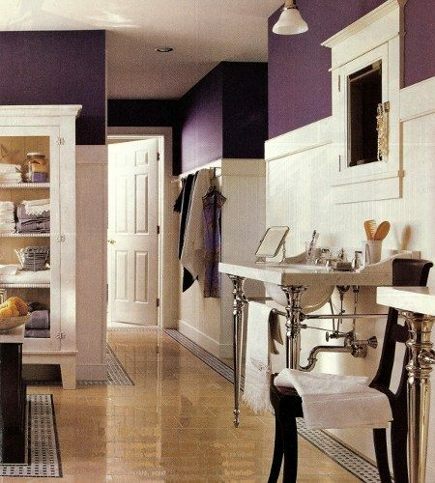 In purple bathrooms, hues can range from periwinkle to plum. Purple bathrooms? Seriously? Purple became a favorite color when I was a teenager and I’ve always worn it. And while it had a wild in/out swing over the 20th century — in vogue during the 1920s and ’60s and out of style otherwise — its current revival for home decor seems especially strong. It’s everywhere from kitchen cabinets to bathrooms like these today. Often combined with yellow or cream, it looks quite right for countrified interiors. 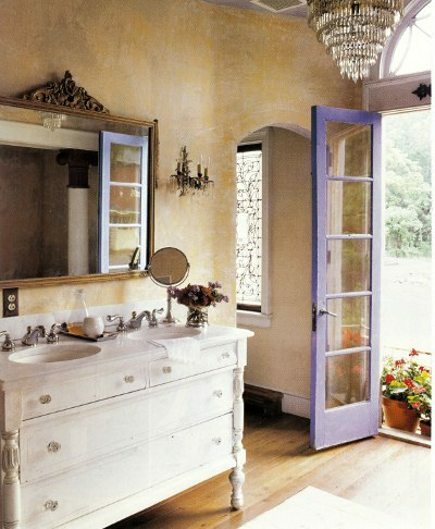 I’ll make a pitch for blue-violet window and door trim – like the one in the cottage bath — particularly in climates with strong light. It’s great with these parchment-hued walls, happy with geranium red as an accent, and peacefully blends with the gilded mirror and the vanity crafted from a whitewashed vintage chest. With its limestone floor and marble-dot-tile borders, this stately master tilts towards Deco. We’ve seen the twin Michael Smith Kallista marble consoles used before but the choice of full-on royal-colored walls with white trim seems daring and assertive. Slipper, or clawfoot, tubs often have brightly painted exteriors (or they can be black) to contrast with their decorative feet. 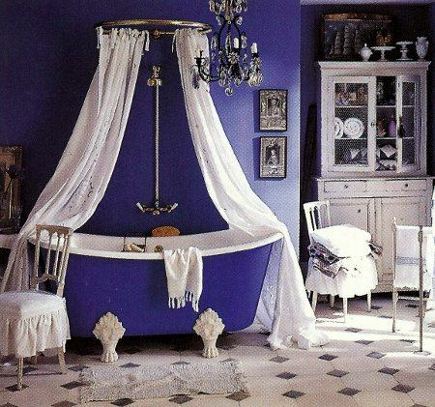 I couldn’t resist including this eccentric blue-violet bath with its old-fashioned ringed shower curtain. These tubs are made new in the same style and it’s great to salvage and older ones which are still viable. was wondering what color that was on the walls with the bathroom with the purple door and what kind of wood is on the floors?? ?